Editor’s note: This article is part of a series marking International Women’s Day, on March 8, 2016. Read the latest from Global scholars on bridging the gender inequality gap, women’s well-being, and gender-sensitive policies in sub-Saharan Africa. This Tuesday, March 8, marks the first International Women’s Day since world leaders agreed last September to launch the Sustainable Development Goals (SDGs) for 2030. A more rounded conception of gender equality marks one of the SDGs’ most important improvements compared to their predecessor Millennium Development Goals (MDGs). Two SDG targets help to illustrate the broadening geopolitical recognition of the challenges. They also help to underscore how much progress is still required. The inclusion of SDG target 5.3 adds one of the most important new priorities to the global policy agenda: to “eliminate all harmful practices, such as child, early and forced marriage, and female genital mutilation.” Until only a few years ago, the child marriage portion of this target had received only scant international attention. The driving force advancing the issue has been Girls Not Brides, a fast-gelling coalition that now includes more than 550 civil society organizations from over 70 countries. The initiative was first spearheaded by Mabel van Oranje, the dynamic international policy entrepreneur. At a practical level, ending child marriage faces at least two major challenges. First, it is largescale. Every year, an estimated 15 million girls around the world are married before the age of 18. Second, it is highly complex. There are no simple solutions to addressing cultural practices with deep roots. Impressively, Girls Not Brides has already published a thoughtful theory of change to inform policy conversations, accompanied by a menu of recommended indicators for measuring progress. Regardless of whether this specific theory turns out to be correct, the coalition deserves significant credit for advancing public discussions toward practical action and outcomes. One can only hope that every constituency that lobbied for an SDG target presents similarly considered proposals soon. The advocates for ending child marriage have already registered some early gains. In 2015, four countries raised the age of marriage to 18: Chad, Guatemala, Ireland, and Malawi. The SDGs are also carrying forward the previous MDG priority of maternal health. Target 3.1 aims as follows: “By 2030, reduce the global maternal mortality ratio to less than 70 per 100,000 live births.” Formally this falls under Goal 3 for health and wellbeing, but it certainly represents a gender equality objective too. Part of that is by definition; mothers are female. Part of it is driven by the need to overcome gender bias; male decision-makers at all levels might overlook key health issues with which they have no direct personal experience. As of the early 2000s, maternal mortality was too often considered a topic only for specialist discussions. One of the MDG movement’s most important contributions was to elevate the issue to the center stage of global policy. For example, former Canadian Prime Minister Stephen Harper made it a centerpiece among his own foreign policy priorities, including at the G-8 Muskoka summit he hosted in 2010. 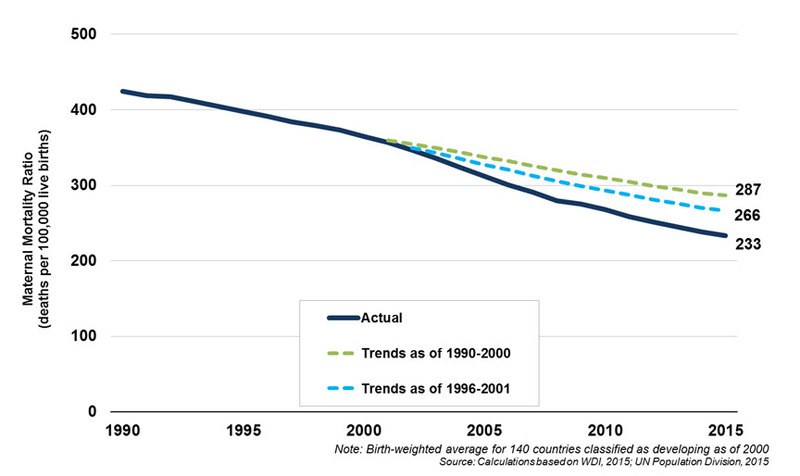 The graph shows that developing countries’ average MMR dropped from approximately 424 deaths per 100,000 live births in 1990, down to 364 in 2000, and further to 233 in 2015. That works out to a 36 percent decline over the past 15 years alone, driven by acceleration in progress during the mid-2000s. Importantly, the value in 2015 was also at least 12 percent lower than it would have been under pre-MDG rates of progress—287 under 1990-2000 trends and 266 under 1996-2001 trends. Although the SDG for maternal mortality is set at a global level (unlike the country-level target 3.2 for child mortality), it is worth assessing how many individual countries are trailing the MMR benchmark of 70. The geographic nature of the global challenge is underscored in Figure 3. It lists the number of countries with MMR above 70 across the respective years 2000, 2015, and—on current trajectory—2030. As of 2000, 90 countries still had MMRs greater than 70. By 2015, this was down to 77 countries. 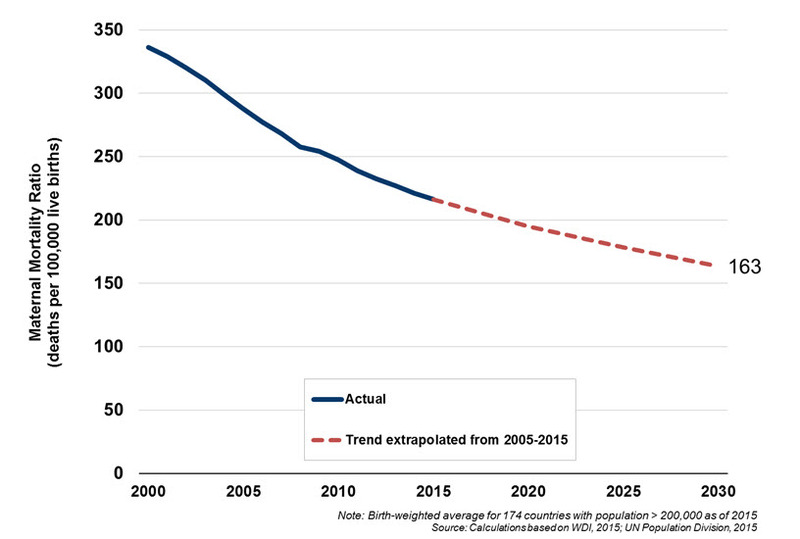 By 2030, on current rates of progress, the relevant figure drops only slightly to 68 countries. Most notably, the figure for sub-Saharan Africa remains unchanged between 2015 and 2030, at 44 countries, even though most of the region is already experiencing major mortality declines. Rwanda, for example, saw its MMR plummet from 1,020 in 2000 to 290 by 2015. 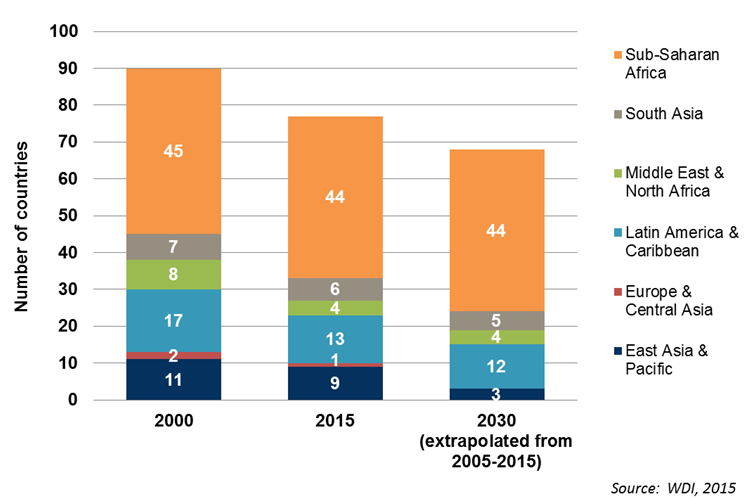 It is on track to reach 106 by 2030. Meanwhile, Sierra Leone saw a decline from 2,650 in 2000 to 1,360 in 2015, on a path toward 768 in 2030. The challenge is not a lack of progress. Instead, it is simply that these countries have huge ground to cover to reach the ambitious goal. On current trajectory, 11 African countries are on course to have MMRs of 500 or greater in 2030. Although these two targets for child marriage and maternal mortality embody only a small portion of the SDGs’ broader gender equality imperatives, they reflect crucial aspects of the overall challenge. On the positive side, they provide inspiration for the ways in which long-overlooked issues can rapidly gain political and policy traction. But they also underscore the scale of the task ahead. The global challenges of gender inequality—ranging from discrimination to violence against women to inequalities of opportunity—all require dramatic accelerations in progress. On this International Women’s Day, we all need to recommit to break from business as usual. Our mothers, sisters, daughters, and partners around the world all deserve nothing less. Note: The maternal mortality figures presented above have been updated subsequent to the original post in order to correct for a coding error discovered in the original country-weighting calculations for global trajectories.